Available in print as of October 31, 2013 through Lulu! Music by Scott McCord. Publisher, Triple Take Productions. A "more musical" version will be published at a later date. 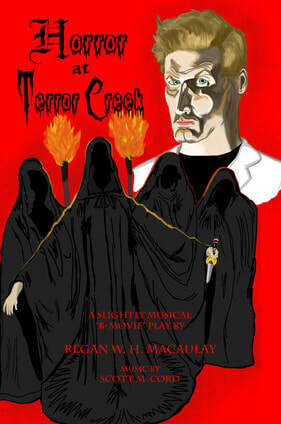 Synopsis: Fanny Punn, grad student, is working on her thesis, a study of an antiquated town called Terror Creek. For some reason, all the surrounding villages have failed, turning into ghost towns while Terror Creek thrives. At the Athame Inn, Fanny meets many a peculiar character: Ligeia, Satanic High Priestess; Dr. Audley Salmon, resident Mad Scientist; Raven, the Mute Maid; and Edgar, the Bellboy who speaks like a poor-man's Poe. Here, Fanny stumbles on to a startling secret, sealing her fate, and the fate of her friends, forevermore.